I've been on a roll lately if I do say so myself. I do most of the cooking for the household and over the last couple of weeks I've had a string of successes with some new recipes. Now, I'm not much on originality but I do like to try new things. Sometimes these work out better than others and you are free to chalk that up to the recipe itself or the skills of the cook. sometimes its both and sometimes neither and sometimes some combination of that and/or personal taste(s). It is a point of aggravation with my wife that I critique the meal as we eat it. This has been made worse by the fact that I often invite my neighbor who is French, and has many years in the food service industry, to try new dishes. We are birds of a feather when it comes to critiquing food and I know I will always get an honest critique from him. I get an honest critique from my wife as well, only more subtle. If she goes back for seconds then I've done very well. The scale then descends to a clean plate, food left on the plate, and then those miserable failures when we go for a bowl of cereal. It happens. Here it is. I hope you enjoy it. Bon appetite. Oh yeah, the Frenchman liked it too. note- I use a cast iron skillet and plain old Canola oil. and lots of garlic. Because its whole it does not impart a strong flavor to the dish. Its nicely roasted when its done and you just squeeze it out- yum. 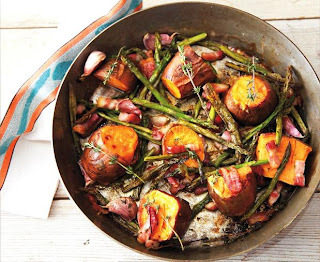 Preheat the oven to 425 degrees, Arrange the sweet potato chunks in the pan and then drop in most of the lardons or bacon, followed by the asparagus tips and garlic cloves and, finally, the remaining lardons. Sprinkle with the thyme, pour the oil over, then bake in the oven for 30 minutes, before turning the sweet potatoes over and baking for another 30 minutes. Let everything cool before dividing between 2 plates, strewn with salad leaves if desired. Sprinkle with some salt or chili sauce, or both to taste. This looks good. When I lived in Beijing I used to always buy the roasted sweet potatoes that they cooked in a barrel right on the street. I love sweet potatoes! Though I've never been to China, I think you may find some similarities to your Beijing memories here. After roasting for an hour these are great! I actually chop them slightly smaller to help fit in the pan and they cook really well. Oh yeah- better to use the dark red taters- they're sweeter.